I mentioned that I found Not Without My Daughter a compelling story that I had a hard time setting down. The same is true of My Name is Mahtob. It was curiously interesting to hear Mahtob's "side of the story" and catch her impressions of her's and her mother's experiences. Most interesting to me was all that she shared about her growing up years in America. How did she handle re-integration into this country? What does she think of her father now? Did he ever try to find her and take her back to Iran as threatened? Where is she living and what is she doing as an adult? This book answers all of these questions and then some. Clearly Mahtob has her mother's panache in being able to connect with her readers. She has the same manner of storytelling which I found absolutely compelling and which held my attention. Again, I think part of the reason (mind you, it's a small part) that this story is so engaging is that it is so unique. While many women might have experienced what Betty and Mahtob have endured, how many of written of their experiences and have traveled to share of their experience with others? Not many. Mahtob travels back in time with her readers to 1984, relaying what she recalls of the flight to Iran and the Mahmoody family's immediate interactions and experiences with the culture as well as her father's family. She documents her memories of school attendance, shopping excursions, food she liked (and didn't like), how she felt when her father began to physical abuse her mother, and so on and so forth. She had a sharp memory even at a young age and she recalls her experiences in vivid detail at times. It's quite fascinating. After sharing what her early childhood was like in Iran, Mahtob brings the reader to the present day where we are offered a glimpse as to her adult life. The majority of the book, however, it spent on the "in between" years - after coming back from Iran and up to the modern day.We learn everything from her days in a private Lutheran school to college life. We follow along as she adapts and adjusts back to "American-isms" and then, too, how she has battled certain health scares in her teenage and adult years. My Name is Mahtob is a must read for anyone who cared for Not Without My Daughter and who wants to find out "the rest of the story" as Paul Harvey liked to say. 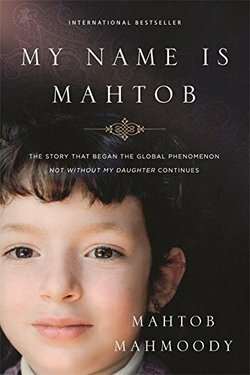 I don't think this title is quite so engaging as her mother's, but Mahtob offers us something not available in her mother's book -- time and perspective. Not Without My Daughter was written fairly soon after their arriving back in America. My Name is Mahtob was written over twenty years later. It's always interesting to look back on life's events and re-examine them with a bit more age and maturity under your belt and that's what this book feels like -- a developing revelation as to who Mahtob Mahmoody is now in light of her past history. I am definitely delighted to have read this book and I heartily recommend it to you. It's worth a bit of your time. My thanks again go to Suzanne who recommend this book to me in the first place. Appreciate it! I'm so glad you enjoyed the book. I know I was enthralled with her perspective and I'll not lie, I was absolutely curious as to how she turned out as an adult. This sounds like a definite must-read for those who have read the first book or were familiar with the story and wondered how everything turned out.